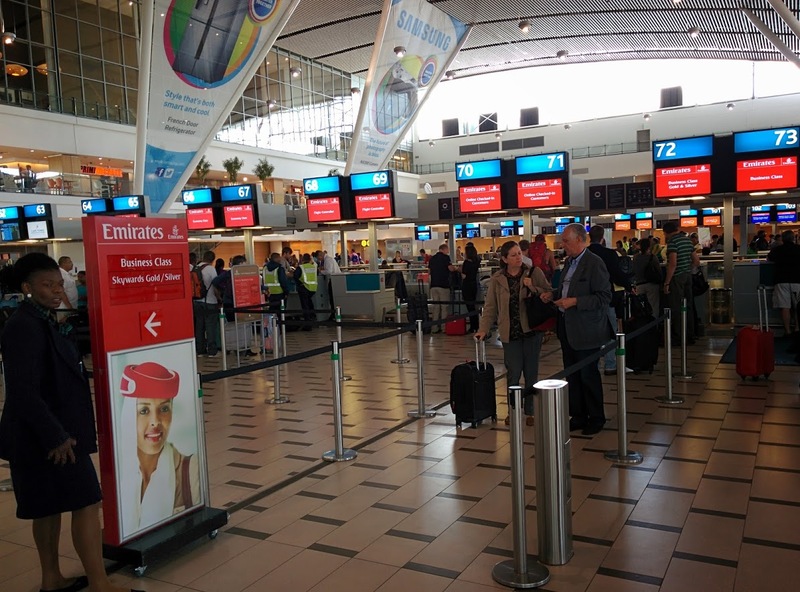 Emirates Cape Town flight bookings qualify to earn SouthAfrica.TO travel vouchers. Simply email a writeup of your flight to cheapflights@southafrica.to and we'll send you vouchers. Easy. It seems crazy on may flight routes, but taking a large detour from the via Dubai is often the cheapest way of flying to your destination. Emirates (EK) offers double-daily flights from Cape Town to Dubai & onward to most major destinations in the world. To book a cheap Emirates flight from Cape Town International Airport (CPT), use the flight bookings tool on the left. 1 Dec 2013. Emirates switched from using an A340-300 on its EK770/771 flights from Cape Town to Dubai, to B777-300ER aircraft (they previously planned to make this switch on 21 July 2014). Written by our readers who earned travel vouchers for submitting them. 22 May 2013. Rating 5/5 : I travelled on Christmas day with my family from Cape Town to Chongqing, China with Emirates Airlines. It was my children's first international trip, their ages were 6 and 4 ( Boys ) and they were very excited at the prospect of watching movies on the plane and playing games, Emirates has ICE entertainment aboard the plane which is fabulous. Upon boarding the plane they recieved gifts from the air stewards which they really enjoyed. My eldest son suffers from motion sickness and approximately 2 hours into the flight he vomitted. 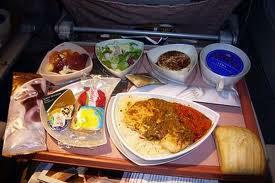 The air hostess was wonderful as she cleaned up his seat and the carpet as well, and made him feel very comfortable. After dinner he vomitted again and this time he was allowed to make use of the bathroom in business class which was really nice. When we arrived at Dubai Airport for our flight to Beijing, my kids were given more gifts and lots of drinks before disembarking, which was another good gesture from the friendly hostess. Our transfer was approximately 3 hours and we spent our time shopping at the Airport and bought more motion sickness medication for him. Upon the A380 from Dubai to Beijing my kids basically slept the entire flight, but my eldest son woke up with a bloody nose, which he occassionaly gets. Yet again the very concerned and helpul Air hostess took care of him and stopped the bleeding while I asked to be taken upstairs to view the business class. I was surprised when I returned to my seat to find that they recieved so many gifts, toys and lots of chocolates and candy. This really capped off what was a memorable journey to China using Emirates Airlines. My kids and wife cannot wait to board another Emirates plane, thanks to the wonderful service they recieved. 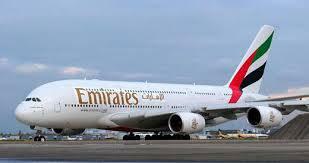 I'm sure we will continue using Emirates as our preffered International Airline in the future.< Written by Mohamed Asmal. 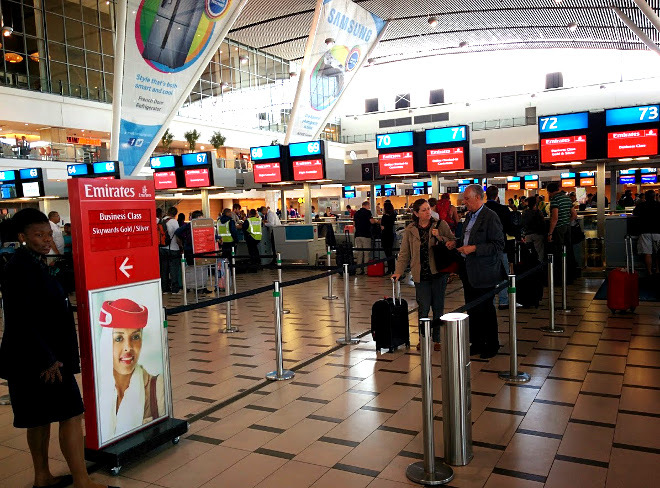 To get to the Emirates check-in counters at Cape Town International Airport, go up the escalators from the ground floor, and then you'll see them immediately in front of you slightly to the right. Those employed by Emirates to man the check-in counters seemed to be mostly South African ladies. We pushed our luck and tried to check-in some of our hand luggage in addition to our bags, and were allowed to! 6 Jan 2012. Emirates flight EK773 from Cape Town to Dubai had to make an emergency landing in Cape Town due to a mechanical failure of the plane's landing gear(it failed to retract after taking off). 14 Apr 2011. Emirates specials from Cape Town. 27 Mar 2011. Awesome to see Emirates Airline investing further in South Africa, by introducing a 2nd daily flight from Cape Town International Airport. They are the only airline operating international flights from Johannesburg, Cape Town and Durban. Emirates will fly an A340-500 (in a 3-class config) non-stop twice a day from Dubai to Cape Town from the 27th March 2011. “South Africa and the United Arab Emirates enjoy a thriving trade and investment relationship and the launch of our second daily service to Cape Town will help boost this further by supporting new business and tourism opportunities. We have seen very strong inbound and outbound demand for our South African services over the last year. This new frequency will bring one of South Africa’s leading tourist destinations within easier reach for visitors, as well as meet the needs of our South African customers for enhanced connections from Cape Town to Europe, the Far East and a host of other points across Emirates’ extensive global network,”said the Divisional SVP of Emirates' Commercial Operations, Richard Vaughan. Great to see Emirates Cape Town growing its service, I'm hoping that one day we could end up seeing an A380 in Cape Town (as enjoyed on Emirates flights from Manchester).